Trying to take good pictures of your eBay merchandise can be frustrating. If you don’t have enough light and use the camera’s flash, the image might be washed out. If you take the item outside, the sun might cast a shadow. The autofocus feature on many digital cameras doesn’t work well in low light. Some eBay sellers use a flash and instruct their children to shine a flashlight on the item as they photograph it from different angles — all the while hoping that the color isn’t wiped out. 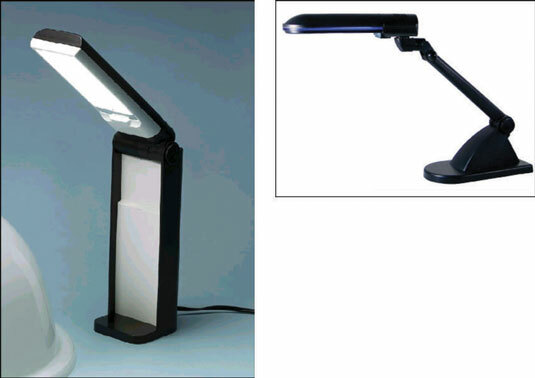 An inexpensive studio lighting set for online product photography is available at coolebaytools.com. Professional studio lights can be expensive, but you might be able to find a set for around $150. (You need at least two lights, one for either side of the item, to eliminate shadows.) Search eBay for used studio lighting; you can always find a good deal. If you’re photographing small items, you can successfully use an Ott-Lite or a less expensive, generic true-color version. The lamp’s bulb is a full-spectrum, daylight 5000K florescent tube, good enough for jewelry photography. This same light is used for grading diamonds. The color temperature of a light, which ranges from 2500dgK to 7800dgK, is a number given to a lighting condition. The K after the number signifies the Kelvin temperature range. Actual daylight color temperature is about 5500dgK, and it’s best to get your lighting as close to that as you can. Using a bulb with a daylight number is important because it’s a pure neutral, which means that it throws no blue or yellow cast on your images.